2. In a large mixing bowl thoroughly combine dry ingredients. 3. Grate the butter into the flour using the small holed side of a box grater. Mix the butter into the flour. 4. Combine the wet ingredients together and add them to the dry ingredients. 5. 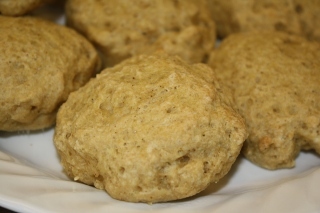 Use a large spoon to drop 8 biscuits onto a sheet lined with parchment paper. 6. Cook at 350 degrees for 15 minutes or until golden brown. 1. Use 1 c. buttermilk in place of the rice milk and vinegar if you aren’t dairy free. 2. Earth Balance Buttery Sticks work great if you need this to be casein free. 3. Thanks to Kate at Gluten Free Gobsmacked for the tip on grating the butter. It was so easy! 4. I wet my hands and smoothed each biscuit before I baked them for the look you see in the picture. Otherwise however you drop them will be how they bake.